HostPapa is a Canada-based company that focuses on providing environment-friendly web hosting services fuelled by green energy. This privately-owned firm was founded in 2006. HostPapa provides shared web, VPS, and reseller hosting plans. It offers free SEO tools as well as the Fantastico script installer that supports Joomla, WordPress, wikis and more. The company provides a 30-day money back guarantee. HostPapa provides a 99.9% uptime guarantee, but it does not give any refunds for downtime. The company’s data centers are equipped with advanced infrastructure and security measures such as UPS power system and diesel generators, and 24/7 network monitoring and security. HostPapa regularly backs up its servers to be on the safe side in case of a system failure. The company advises its customers also to regularly back up their data and sites. How Much Does HostPapa Cost? HostPapa offers the popular cPanel control panel for account management. Subscribers of reseller plans can utilize WHM along with Cpanel. Windows hosting users are offered the WebsitePanel CP license for free. Every company has its own characteristics, and may need a special solution that will be fit for their business size, type of customers and employees and even particular niche they support. You should not count on getting an ideal service that will work for each company regardless of their history is. It may be a good idea to read a few HostPapa reviews first and even then you should remember what the hosting service is supposed to do for your business and your workers. Do you need a simple and straightforward hosting with just basic features? Will you really use the complex functionalities required by pros and big enterprises? Are there any specific tools that are especially beneficial for the industry you operate in? If you ask yourself these questions it will be much easier to get a trustworthy service that will fit your budget. We realize that when you make a decision to buy Hosting Services it’s important not only to see how experts evaluate it in their reviews, but also to find out if the real people and companies that buy it are actually satisfied with the product. That’s why we’ve created our behavior-based Customer Satisfaction Algorithm™ that gathers customer reviews, comments and HostPapa reviews across a wide range of social media sites. The data is then presented in an easy to digest form showing how many people had positive and negative experience with HostPapa. With that information at hand you should be equipped to make an informed buying decision that you won’t regret. HostPapa offers 24/7/365 customer support through phone, live chat, tickets and email. The company provides support in French, German, and Spanish too, besides English. HostPapa also provides country-specific contact numbers on its website. For self-help, HostPapa offers a knowledge base, multi-lingual video tutorials, and a user forum. The company actively uses Facebook and Twitter to respond to customer queries and issues. It also has a YouTube channel and Google+ account. What are HostPapa pricing details? HostPapa provides the popular cPanel control panel for account management. Users of reseller packages can also utilize WHM along with cPanel. Is it a good hosting for e-commerce? Do they offer SSL, shopping carts and payment processing? HostPapa offers SSL certificates at an additional cost. Using the certificates can enable your website to securely offer e-commerce. Do they give an uptime guarantee and pay you back for downtime? HostPapa offers a 99.9% uptime guarantee excluding scheduled maintenance. It does not seem to offer refunds for downtime. Will you receive a free domain with their hosting plan? Yes, HostPapa offers a free one-year domain name registration for those who buy plans of minimum one-year duration. Do they offer unlimited email addresses and bandwidth? Yes, HostPapa offers unlimited email accounts and bandwidth with its premium plans. HostPapa accepts PayPal and major credit cards. Do they provide both Windows and Linux hosting services? Yes, HostPapa offers both Windows and Linux hosting services. Yes. HostPapa provides a simple one-click installation process for WordPress blogs. HostPapa’s data centers are equipped with state-of-the-art infrastructure and security measures enabling the company to provide reliable and secure hosting services. Do they enable you to easily set up a website with no HTML or coding skills? 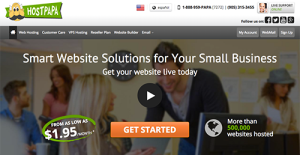 Novices can use HostPapa’s easy-to-use site builder tool that includes thousands of templates. If you need more information about HostPapa or you simply have a question let us know what you need and we’ll forward your request directly to the vendor.